It’s hard for me to believe but my last post was in December of 2014. Do I have a good reason for being away this long? Not really. Life happens. Frustrations happen. The good news (for me and hopefully for all of You!) is that I’m back. My fingers have been itching for many months to be back here typing away but I haven’t done it. I am now and I’m very happy to be back. I’ve got to come up with a plan for how I plan to handle my return. It won’t be every day and in truth I don’t know how I did that when I started BCDC. When I figure it out, I’ll share it. In the meantime I’ll be poking around at various topics, plans and link-ups that I find interesting. But it does feel good to be doing it again. Life has been interesting lately. Ralph and I just returned from a 3 1/2 week trip to New Mexico. It was wonderful and awful all at the same time. Wonderful because we were there, awful because we had to return to New Jersey. I tried to come up with every excuse I could think of to be able to stay, but it didn’t work. So I’m back in New Jersey. It’s nice to see lower gas prices. The prices we saw were all over the place, all much higher than NJ. In fact the prices here were lower when we got back than they had been before we left. It’s also a plus that we’re back when the leaves are starting to turn into fall. I love that of course. 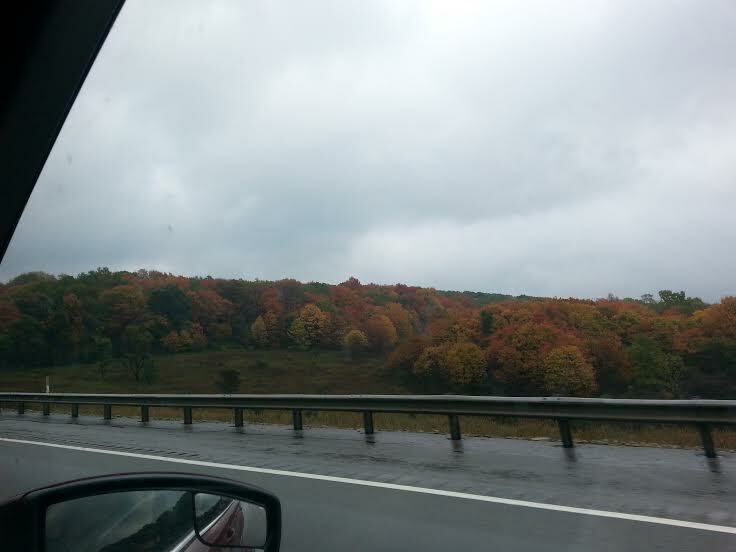 Coming East through Ohio and Pennsylvania the leaves started to share their beauty and it was worth it. A safe return after an approximately 3000 mile round trip journey is a good thing. It was a trip with its ups and downs but we were in New Mexico so it didn’t matter. We got to see some parts of NM we hadn’t seen before and that was great. As I get back into this whole process, I’ll be sharing more of what’s been going on. I hope that I haven’t lost you all completely. Please comment to let me know you’re still here. I look forward to hearing from all of you. I know I’m glad to be back. It feels good. Thanks, Eleni!! It feels good! Thanks, Sweetie! We should try to get together if you’re still in NJ. Hugs!